Gwen and Elyan 5x06 preview (2). Finally brother and sister time but oh after that.... Wallpaper and background images in the Arthur and Gwen club tagged: angel coulby gwen bradley james arthur. 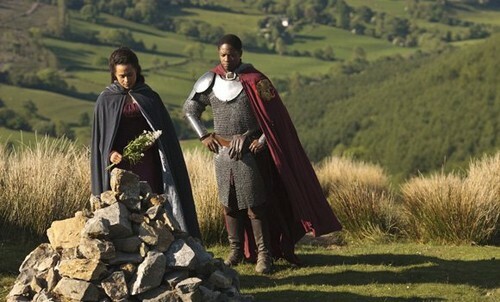 This Arthur and Gwen photo might contain surcoat. Having major internet problems so I'm surprised I was able to upload these, but we finally get some brother sister time. You can just imagine what this is. Awwww. Be back later if I can. It is Gwen and Elyan's father's grave.